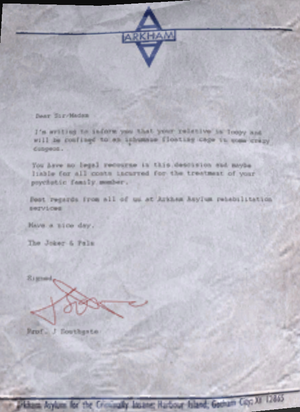 In the PS3 version, players were able to play as The Joker via a free DLC from PSN along with his own challenge maps, moves, game over screens featuring Batman and Aaron Cash, and in his map for obvious reasons the Joker Goons on the maps were changed to Arkham Guards along with appearances from Zach Franklin, William North, Louie Green, Eddie Burlow, Aaron Cash, Henry Smith, and Commissioner Gordon. Players who hack the game files in the PC version can play as well, as long as it is not the GOTY (Game of The Year) edition. Sound files for Joker at the start of the maps. Sound files for the Guards when fighting Joker. The game features copy protection in the form of game-breaking glitches designed to stop pirates from going very far into the game. First, Batman's glide move (which is needed to both sneak up on enemies and land in areas that you can't reach via normal jumps) is glitched, which means you can't proceed past a certain point. This particular glitch made the news at various websites, mostly because of a guy who unintentionally outed himself as a pirate at Eidos' forums. Second, Batman's grappling hook will not work on certain ledges or vents. Since you can't reach them, you're stuck and can't go further. Third, sometimes you will see the grappling icon show up in random places while playing. If you use the grappling hook, you will be transported out of the room to an invisible ledge that you can't climb. If you drop down, you'll fall on a platform and you can't get out other than by killing yourself. 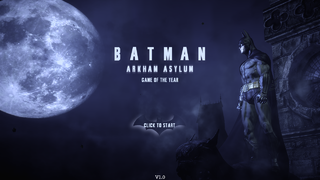 Depending on where you do this, you can end up outside the map or in the waterfront surrounding Arkham Island. In a normal game, you can't use any of your weapons, run, or jump while talking to Oracle, but you can walk around the room. Once the conversation ends, you regain full control over Batman. But here, Batman never takes his finger off his cowl, so you can't exit the room. When you reach the Elizabeth Arkham Glasshouse at the Botanical Gardens, well... there's nothing there so you just fall to your death. No boss fight for you! Judging from the videos on YouTube, they appear to be completely random, so what you get in one playthrough may not show up in another. There may be more glitches to be found. 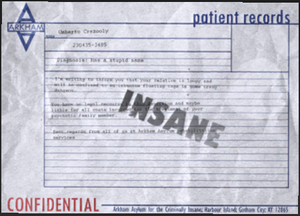 In the game, most papers found in the levels have 2 funny texts relating to the intake of patients into Arkham Asylum. Since they cannot be read properly in-game, their text is transcibed here. This page was last modified on 4 June 2018, at 21:45.